Congratulations to our Fall candidate class - Alpha Epsilon! The Zeta Xi chapter would like to congratulate the 26 men of the Alpha Epsilon class on accepting their bids at Sigma Nu! Brothers and candidates enjoyed a night of broomball as a welcome to the chapter! 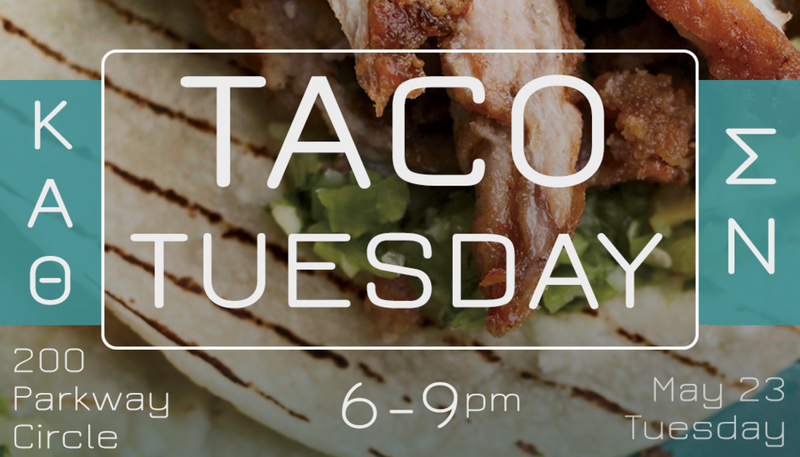 Kappa Alpha Theta & Sigma Nu invite you to Taco Tuesday on May 23 at 200 Parkway Circle. Proceeds go to the Davis Pantry which provides students under financial burden with food and basic necessities. Presale tickets are $5 and $7 at the door. Come out, support the Pantry, and enjoy some tacos! Interested in rushing? Spring rush starts Monday, April 10th. All events will be at 7pm at our chapter house located at 100 Parkway Circle, right across the street from the ARC. The Sigma Nu Fraternity would like to give a large thank you to UC Davis Football head coach, Dan Hawkins, for speaking to us about ethics today! He's an Aggie Alumnus with a lot to offer not just to the football program but to the entire school as well! His talk with us was stimulating, motivational, and enlightening. Thanks again Coach for your time and words of wisdom. Congratulations to Sigma Nu's New Eminent Commander and Lieutenant Commander, Toby Clark and Jerry Saldivar, respectively. We're confident that with their leadership, Sigma Nu will continue to improve itself and our surrounding Davis community! The Sigma Nu Fraternity is happy to announce that our new Sweetheart will be the lovely Julia MacLaren of the Kappa Kappa Gamma sorority. We are very excited and thankful to have her assisting the brotherhood and representing the chapter well in 2017. The Sigma Nu Fraternity was happy to have some of the players of the UC Davis Men's Basketball team over to get hyped up before their big game tomorrow. They will play UC Irvine tomorrow at 5pm for control over the top seed in the Big West Conference. Come watch the game with the brothers of Sigma Nu, GO AGS! The Zeta Xi Chapter of Sigma Nu is proud to announce that we have initiated the 19 members of the Alpha Beta Candidate class tonight! Excited to call these outstanding men brothers of Sigma Nu. Winter Quarter Rush starts this Tuesday January 17th! Congrats to our brothers for winning their second consecutive IM Flag Football Championship! October is National Domestic Violence Awareness Month! Our brother Austin Becker is on a mission to become this year's AXO runway Champion, a philanthropic event that raises money to support organizations like Empower Yolo and PAVE that spread awareness to prevent domestic violence and support survivors. As the quarter wraps up at UC Davis we would like to congratulate Anthony Gonsalves for being the Brother of the Quarter! This quarter he consistently gave guidance to the Fraternity through his position on the Executive Board and having a prominent voice in meetings every week! Special thanks to Sergeant First Class King of the 3rd Special Forces Group out of Fort Bragg for presenting a LEAD session on Team Building and Leadership! Sergeant King presented about the components of a good team and how to create the best possible team for any job. At Sigma Nu, our LEAD Program is a valuable tool used to assist our members in both gaining the knowledge and developing the skills and abilities needed to be an effective and ethical leader for life. This week's Brother of the Week goes to our Eminent Commander Nicky Aikawa! Throughout the week he went above and beyond his position and has showed us his immense dedication and love for the brotherhood at the Sigma Nu Zeta Xi chapter. Last weekend at the Solano Land Trust Community, the members of the Alpha Alpha candidate class along with Brothers Nicky Aikawa, Ryan Prescott, Brandon Hong, John Dolan, and Gerardo Saldivar helped repair and restore the nature trails in the area. Way to go guys!